Theatre and Drama arts involves the study and application of the performing arts. Clark's theatre classes utilize traditional classroom training and allow students to apply their skills in staged productions in front of a live audience. 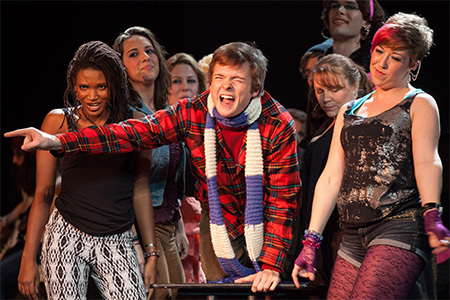 The Clark College Theatre Department hosts a variety of plays and musicals that are open to the public. For show information and to purchase tickets, visit our theatre productions page. Expression of art through live performance is exhilarating and can have long-lasting social and artistic benefits. Clark's Theatre Department offers instruction in acting principles and techniques for stage and television, and the opportunity to perform in a range of plays and musicals for the community to enjoy. Clark is also part of the American College Theatre Festival, which allows students to gain experience in competitive stage production and performance against other colleges and universities in the region. Employment opportunities for the performing arts exist in a variety of fields that include: theatre actor, actress, voice-over artist, and narrator. Clark offers an Associate of Arts degree (AA) designed for students planning to transfer to a four-year institution to pursue a bachelor's degree program in the performing arts.